MAC Strobe Cream is one of those products I often hear raved about on other blogs but one I've never fancied trying myself. I think its mainly down to my love for powder highlighters and the fact I've not been blown away by any cream and liquid highlighters I've tried in the past. However, when I recently repurchased my Smolder eye pencil from the MAC website, they threw in this little Strobe Cream sample with my order. I decided to give it a go to see what all the fuss is about and I have to say, I can see why its such a popular and well-loved product. I've been applying it on my cheekbones and down the centre of my nose and it gives my skin the most beautiful iridescent glow. 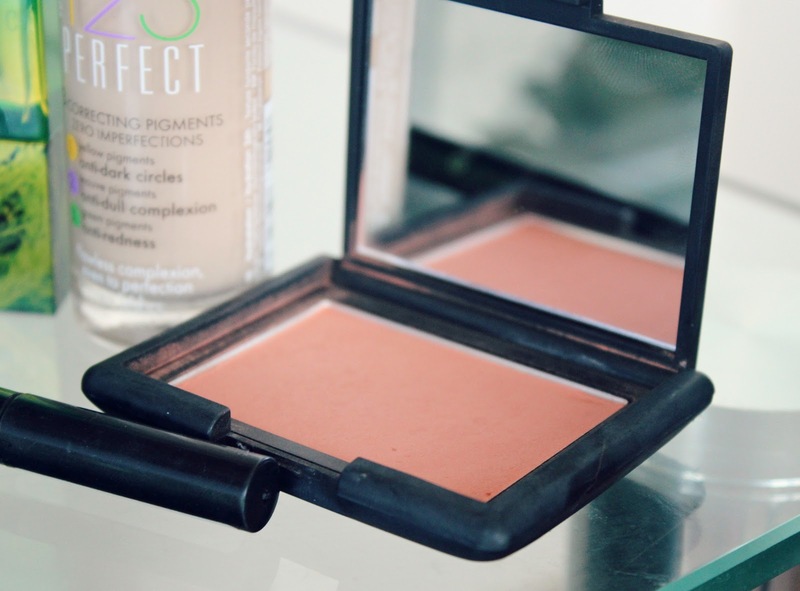 It isn't shimmery (more of a pearly sheen) and it gives my skin some much needed radiance. I've been suffering with a lot of dry patches and dullness lately so this has been a real pick me up product for my skin. I actually find it looks more natural than my powder highlighters too and it can even be mixed in with moisturiser or foundation for all-over dewy-ness. If you're after that Millie Macintosh glow - this product is for you! Also, even though the cute sample I received is teeny tiny, I've been using it regularly for a few weeks now and there's still loads left. I imagine the full size would last a long, long time and as soon as I have some spare cash I'll be purchasing it. Oh MAC and your clever marketing tactics - don't give me free samples anymore, its not good for my bank balance! If you didn't already know, I was chosen to be NYX Cosmetics April Blogger of the Month which meant I had the opportunity to test and review four of their lovely products here on my blog. 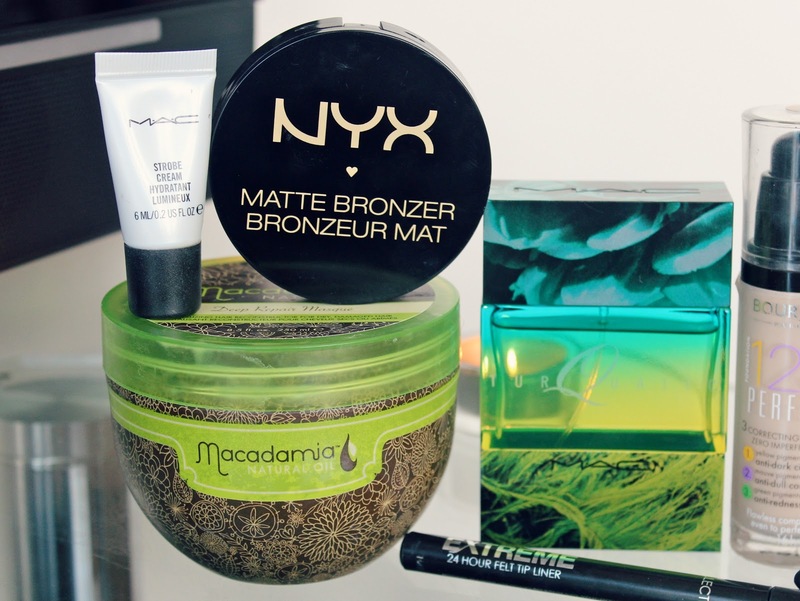 One of those products was the Matte Bronzer and I absolutely love it. My beloved NARS Laguna is slowly but surely running out so I've been saving that for special occasions and using this NYX bronzer on a daily basis instead. I have to be honest, its very similar to Laguna but costs a quarter of the price at only £8.00 - I know, bargain! I find the shade 'Medium' perfect for my skin tone, it doesn't look too orange or 'dirty' and instead adds a nice sun kissed glow to my skin. The matte finish is great for contouring too and the texture is buttery soft meaning it blends like a dream. You can read my full review of it here if you want to know a little bit more about it. I'm going to review this in full soon along with another Macadamia's products so I won't say too much about it other than its a great hair mask that I've been thoroughly enjoying using. Apart from smelling absolutely divine, it really nourishes my hair and leaves it soft, shiny and manageable. A big thumbs up from me! If you've never had a sniff of MAC Turquatic perfume - I urge you to do so, NOW! I remember when I first smelt this perfume whilst browsing the MAC counter a couple of years ago and let me tell you, it was love at first whiff. I actually got this bottle as a Christmas gift from my boyfriends mum and dad but as its more of a Spring/Summer scent, I've been saving it for the warmer weather. Well, as soon as the sun decided to rear its head a few weeks ago, I've been spritzing this fragrance every day. It smells so refreshing, clean and energizing - its absolutely perfect for this time of year. I'm not one for describing scents but if you're passing a MAC counter anytime soon, make sure you give this a sniff. Its beautiful! I bought this Bourjois 123 Perfect foundation on a whim while Boots had a 3 for 2 offer on and I was on a quest to find the perfect high street (or drugstore as you guys across the pond call it) foundation. I bought this one along with a couple more and this has been my favourite of the bunch. I find it an amazing dupe for my beloved NARS Sheer Glow foundation as it has the same medium but buildable coverage, easy to blend formula and natural radiant finish. As I said earlier, my skin has been lacking in the radiance department lately but this foundation has helped to conceal the dullness and add some brightness to my face. It contains colour correcting particles in it to combat dark circles, dullness and redness and I have to say, I agree. I don't usually believe these 'too good to be true' claims but this one really does all three of those things. I'm going to do a post on four drugstore foundations I've been trying soon, this one included, so keep your eyes peeled for that if you want to know a little bit more about it. As you all know, I absolutely adore my NARS Laguna Bronzer so I thought it was about time I added one of their blushes to my collection to see if it'd wow me as much as the bronzer. After deciding I wanted a peach toned blush and doing a bit of research online, I decided 'Gina' was the exact shade I'd been looking for. Its the most beautiful muted peach with a slight gold shimmer running through it and seriously, its the nicest blush I've ever used. I've been wearing it none-stop since I ordered it as it instantly brightens up my face and gives my cheeks some definition and a healthy glow. Paired with Laguna or the NYX matte bronzer mentioned above, it looks beautiful. Much like Laguna, the formula is buttery soft, highly pigmented and easy to blend. A total dream. I think I've featured this product in a monthly favourites before but its so good, its getting another mention. I've been using this Collection 'felt tip liner' for years now and its exactly what it says it is, a liquid eyeliner of the felt tip variety. If like me you struggle perfecting the winged liner effect with your standard 'nib' or brush applicators then you must give this Collection version a try. I find the felt tip style applicator gives me so much more control over the application of the eye liner and creating perfect flicks has never been easier. I use this most days to add a subtle cat-eye and a bit of definition to my top lash line and it really is absolutely fool-proof to use. As well as being exceptionally easy to use, it applies really smoothly, is a really deep black shade and has great staying power too. I'm not sure it lives up to its 24 hour claims but who wears eye liner for that length of time anyway? Overall though, this is a fabulous product and for the cheap price tag, its 100% worth picking up when you're next in Superdrug. I have a lot of love for it - can you tell? So there we have it guys, the products I've been loving lately. What have you been loving recently? 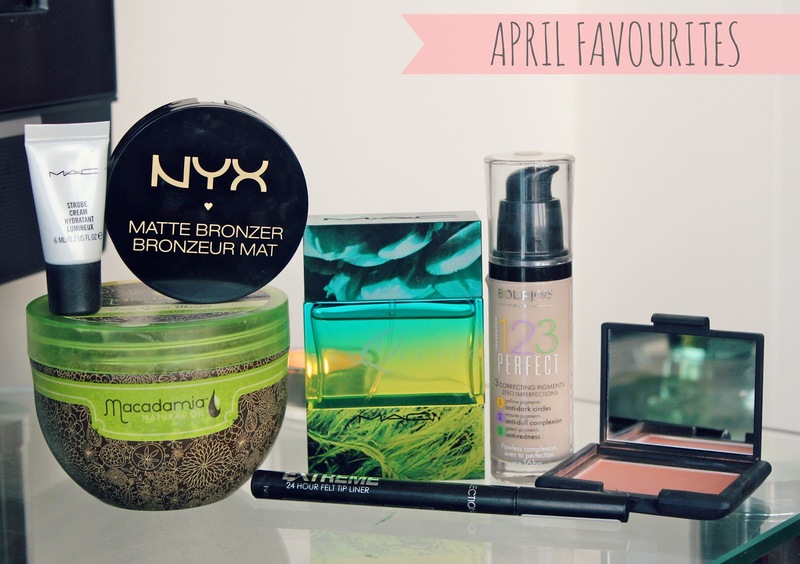 Have you tried any of my April favourites? You've made me want to try all of these products now! 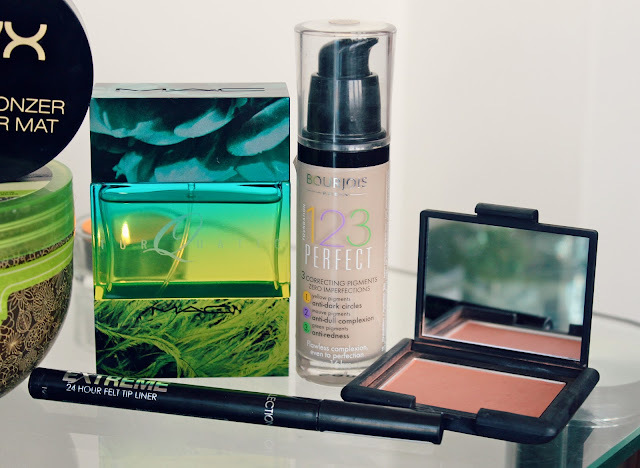 I'm currently using Bourjois Healthy Mix, which I love but now I really want to try the 123 Perfect...I think Bourjois are producing amazing stuff at the moment! The MAC Strobe Cream has been on my 'to try' list for ages as well. And the NARS blush looks gorgeous. Oh Kayleigh, my bank balance doesn't like you :( Haha! I blooming love NARS Gina. I can't ever see it running out either it's soo pigmented! And you've made me want MAC's Strobe Cream too now. It seems like such a good multi purpose product - would be great to mix in with foundation too. I have been wanting to try the Macadamia hair mask for a while, but its so pricey. Do you think its worth the price? NARS Gina is the exact colour I want too! It's the perfect shade, not too pink but not too orangey either! I really want it now after seeing your swatch! Gina is on my wishlist, damn spending ban! I've been hearing so many things about NARS Gina, and I'm so tempted to get it! Ok, now I'm REALLY tempted to buy the MAC strobe cream. Been contemplating about it for a while but you sold me on this one! These are great favourites for this month. The turquatic perfume by Mac is one I will HAVE to smell. I have always wondered if the MAC fragrances are all that good considering they are not well known for their perfumes. I am also looking for a cheaper but good foundation. I use studio sculpt by MAC at the minute but it is a bit pricey. I will have to test that Bourjois one soon. MAC Strobe cream looks amazing, I'm desperate to try it! 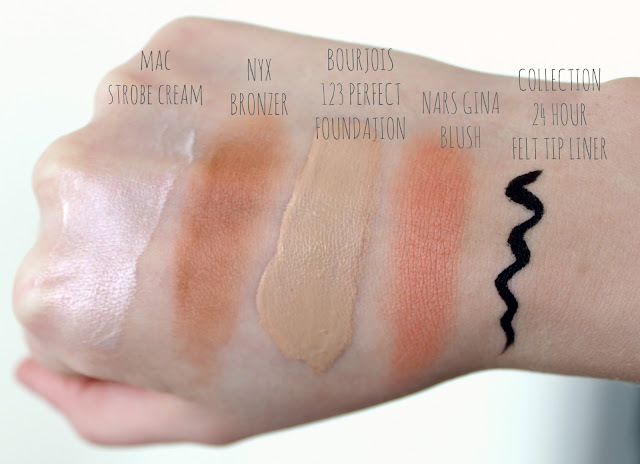 Do you think MAC's strobe cream would be okay even for oilier skin types? I'm looking for a highlighter that won't slip off my face or anything like that! Fab favourites. Have just finished up my current foundations, so might give that one a try next. It's been on my wish list for a while. Gina looks gorgeous and the eyeliner looks so good, love how dark it is! So many lovely things to buy, too little money to buy them, haha! Turquatic is one of my favourite scents as well, which is saying something as I'm really not a perfume kind of girl- just purchased the rollerball version to carry in my bag all the time! I think you've just blown my entire budget for May! I was definitely going to pick up the Macademia hair masque because I've heard so many amazing things about it but now I want the strobe cream, perfume and blush. What is a girl to do?....besides blow her bank account on makeup! great post as always! i really need to smell that MAC perfume. great favourities <3 This Hai Masque sounds so great..maybe this will be better for my hair :) and I heard allot about these bourjois foundation..I think I am convinced now and have to try for myself. I really like the Bourjois foundations and really need to invest in the 123 one! Nice picks I really wanna try the macadamia mask. I've just found your blog! I love it! Everything's too pretty! I really want to try NARS Gina - you're tempting me even more! The Bourjous 1 2 3 Perfect Foundation is one of my favorites as well. It looks so natural! The Bourjois 123 Perfect is great isn't it?! I find it a little bit heavy for this time of year but through winter it's a firm favourite. Gina looks gorgeous too- everyone seems to be getting it at the minute and I'm so tempted to part with my pennies. I have the Macadamia Masque too- it's amazing isn't it?! Nothing comes close to how it makes my hair feel. I hope you're well lovely? It really is time for me to finally try out the Macadamia Hair Mask now that I'm running out of my beloved Aussie 3 Minute Miracle. It's been sitting in my beauty closet for quite a few months! I don't know how I let this happen, haha. Great blog! I have got to try MAC's perfume now! Come by my blog & say hi. Have a great competition running! I also need a bit of advice on my new blog - would be great if anyone could check it out! I need to try this macadamia hair stuff I keep hearing about! Love your blog it is super cute! Can't wait to see your review on the hair mask be thinking about buying this for a while.